Joey Barton could potentially play his last game for Burnley at Swansea City on Saturday. 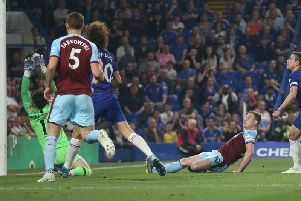 The Clarets midfielder will face an FA commission in the second week in March, after requesting a personal hearing, following charges of misconduct regarding alleged betting breaches. Barton has been accused of placing 1,260 bets on football between March 26th, 2006 and May 13th, 2016, and could be looking at a sizeable suspension. Sean Dyche gave the 34-year-old a deal to the end of the season at the turn of the year, having left for Rangers in the summer, only to leave Ibrox after making only eight appearances. The former Manchester City and Newcastle United man took up an invitation to train with the Clarets in November, before earning a contract, which, Dyche admitted, would come with “certain caveats, obviously, for certain situations should they arise”, with a possible suspension in mind. Previous cases regarding betting breaches have seen Crystal Palace and England winger Andros Townsend banned for four matches, three suspended, after being found guilty of breaking regulations while at Tottenham, while Frome Town manager Nick Bunyard, in November, was suspended for three years after being found to have bet against his own teams.